Miss Boss is the model for those who want a stylish, elegant yet functional business / Cabin bag. The bag is very lightweight and is equipped with silent rolling wheels. The bag opens from the top allowing you easy access to the content. The long, comfortable handles make it easy to carry bag as needed. This business case is in addition to iPhone / laptop compartment also has room for a change of scenery when you're on the road. 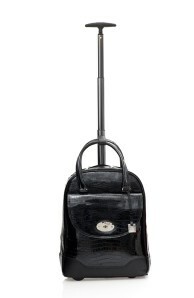 Of course, it is approved as hand luggage on all airlines when flying. The bag is pretty and smooth, which also makes it optimal when you travel by train, bus or subway. After a market study the Swedish company A Bit of Sweden found out there was a lack of stylish and functional business bags for women in the market. On this basis, the company now has developed exclusive and functional business bags for women.